These Laser Pegs are awesome! 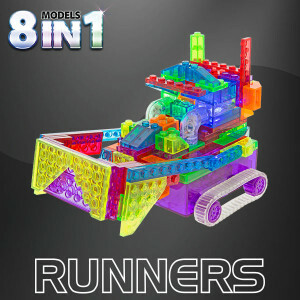 We have the motorized light up construction Runners and the Power Block truck. Imagine legos that light up and you have Laser Pegs. My daughter LOVES the motorized construction Runner because it not only lights up, it also moves on its own. When we first got the sets, we set them up following the instructions. My daughter had a hard time keeping her attention span on building the vehicles to make what was on the box, but when given free rein to design her own, she enjoyed building her own “cars” and “trucks”. These bad boys are fun for all ages and for both boys and girls.